Satoshi admires the three badges he has won already. Rocket Gang repairs its sub, when Nyarth spots the group on a boat. 04:04 1997-1998-M24 Hide sends out a Nyorozo against Satoshi's Pikachu. Nyorozo protects itself with Double Team against Pikachu's 100,000 Volts. Satoshi sent out Lizardon against Nyorozo. Movie 1 BGM - Lizardon merely wants revenge against Nyorozo's Water Gun. 09:13 1997-1998-M49 Lizardon was frozen and Hide decides to have a rematch with Satoshi as soon as he learns to control the Pokémon. 10:29 1997-1998-M51 Satoshi tries to warm Lizardon after the ice cage, but he screams in pain, prompting him to use Flamethrower against Satoshi... except he can't. 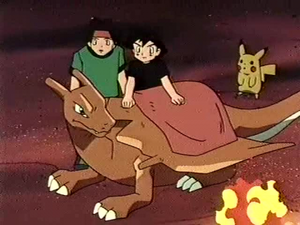 Kenji runs to get more fire wood, Kasumi - a blanket, while Satoshi keeps rubbing Lizardon. Lizardon makes a series of flashbacks, back to when Satoshi (and his friends) found and rescued him and other moments, all while the whole group works to warm him up all night through. Rocket Gang drills the ground with its machine and makes a hole, but Satoshi jumps on Lizardon's back to pursue them and rescue Pikachu. Movie 1 BGM - Watching a seemingly unconscious Satoshi, Lizardon learns Dragon Rage! The song plays during Satoshi's rematch against Hide, now with an obeying Lizardon, which means an obvious result. The group waves goodbye to Hide. 21:28 1997-1998-M46 Lizardon makes a joking Flamethrower against the group.